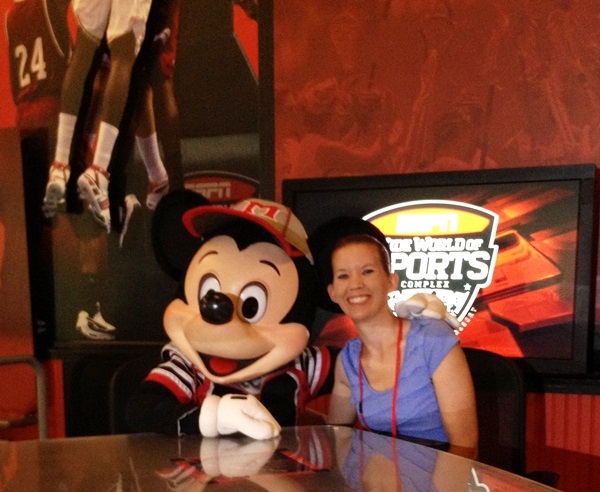 You are here: Home / Travel Tips / What Is The ESPN Wide World Of Sports? I love sports. I played softball, basketball, and volleyball through high school and continued my volleyball career into college and after. I was a graduate assistant for the volleyball team at Kent State and even a head community college volleyball coach for a few years. Since then I’ve maintained an interest in health & fitness and enjoy staying up-to-date on the world of sports. I’m also an avid Disney Parks fan. I’ve visited a number of times in the past few years and I’m always excited to learn something new on every trip. 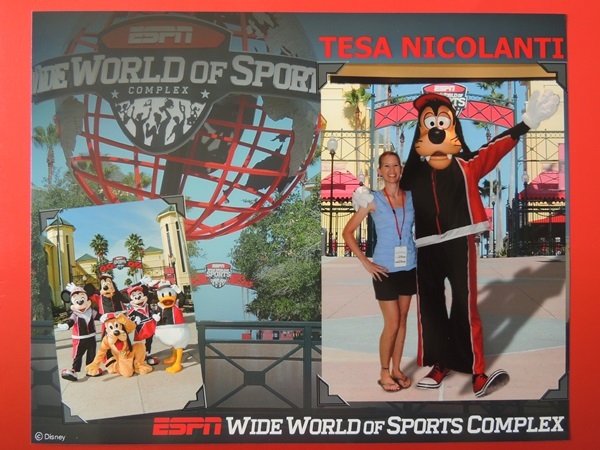 That’s why I was thrilled to be given the opportunity to attend the Disney Sports ESPN Wide World of Sports Festival Media Week. I was excited to be able to bring along members of my family too. My mom and cousins came with me and airfare, accommodations, meals, park tickets, and other gift items were provided. It was a fantastic event where we learned a lot about the complex, experienced Disney magic throughout the trip, and even had the chance to snap photos with our favorite Disney characters. Even though I consider myself to be well versed in sports, health & fitness, and the Disney Parks one question kept popping up in the back of my mind, “What is the ESPN Wide World of Sports?” I would see it every now and then as we’d drive around the Disney area and I did know the Atlanta Braves held spring training there, but other than that I wasn’t sure what the facility had to offer. This tour changed all that. After spending a few days walking around the complex, hearing from executives, and getting a behind the scenes sneak peek at how the complex operates, I’m excited to share what I learned with you. 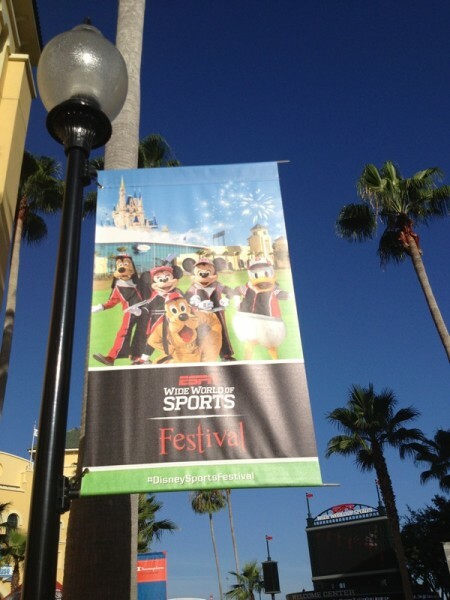 The ESPN Wide World of Sports hosts more than 350 events and 350,000 athletes from more than 70 countries each year. 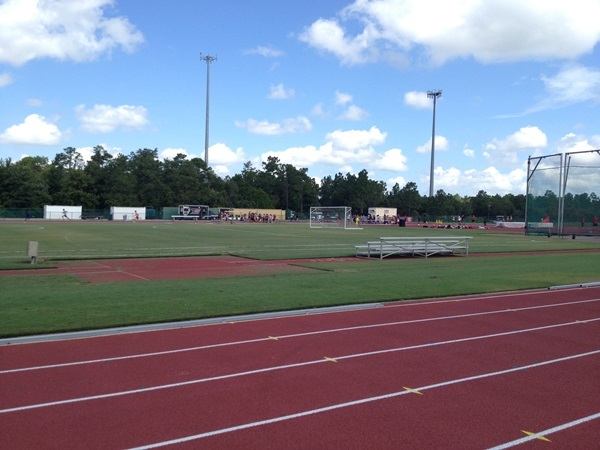 The 255-acre complex accommodates 70 different sports. The complex has 30 outdoor venues and can host 12 basketball games at the same time and 18 volleyball games simultaneously. 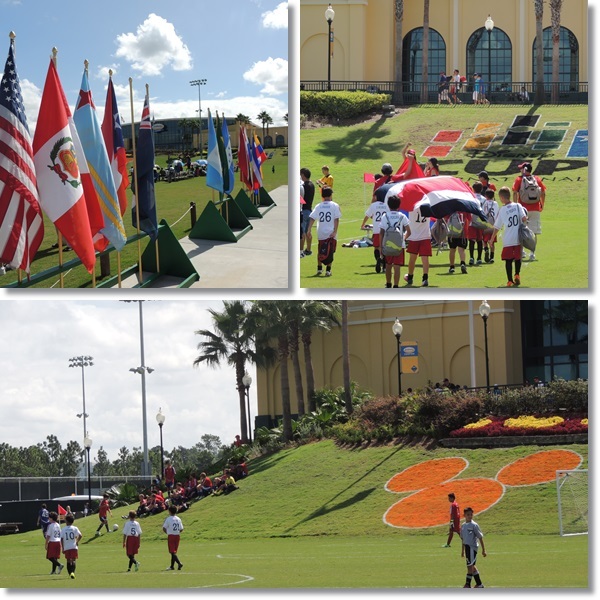 When we were there the Disney Cup International Youth Soccer Tournament was taking place for youth athletes ages 9-18. With 220 teams, 3300 athletes, 900 coaches, and 6600 spectators we were pleased to see the excitement in the air no matter the time of day from the athletes and their parents. Also taking place was AAU Boys Summer Basketball for players ages 8-18. At this event there were 1136 teams and 13,064 athletes. Every gym we walked into had a basketball game taking place. It was captivating to see the kids leaving their hearts on the court and the parents cheering feverishly from the stands. We also got a glimpse of the USSSA Elite Baseball WSI for 10 & under, 12 & under, and 14 & under baseball teams. 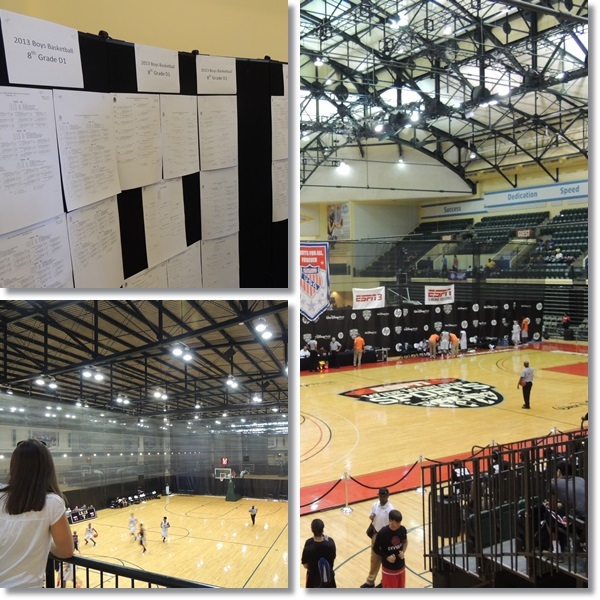 There were 100 teams present with 1250 athletes, 200 coaches, and 1300 spectators. 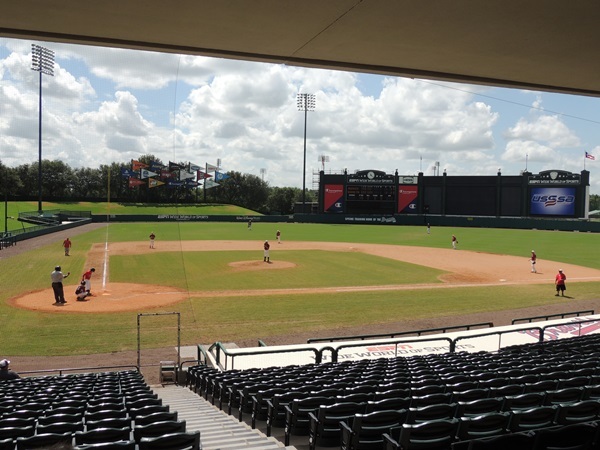 These players had the chance to play in Champion Stadium the same place the Atlanta Braves hold spring training. They even had their names displayed on the scoreboard pro-athlete style – how exciting is that?! What Other Sports Can I Find At The ESPN Wide World of Sports? 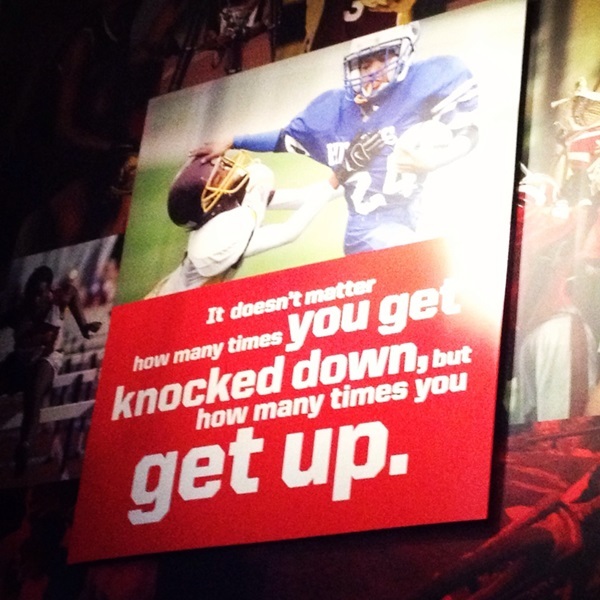 There is also the Pop Warner Super Bowl, the National Cheer & Dance Champions, open registration tournaments, sports academies, camps such as the Drew Brees Passing Academy and the Coach Tom Shaw Speed Camp, and even DI and DII showcases where college scholarships are offered on the spot. 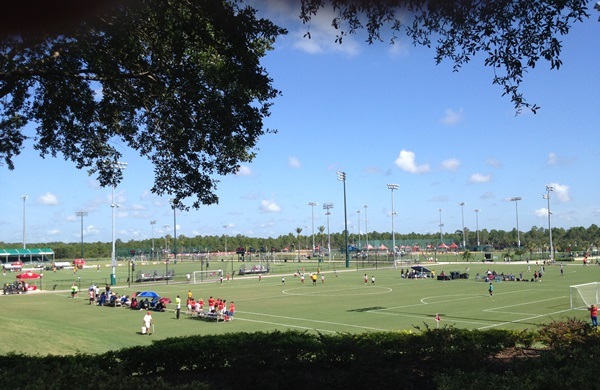 How Can My Child Compete At The ESPN Wide World Of Sports? 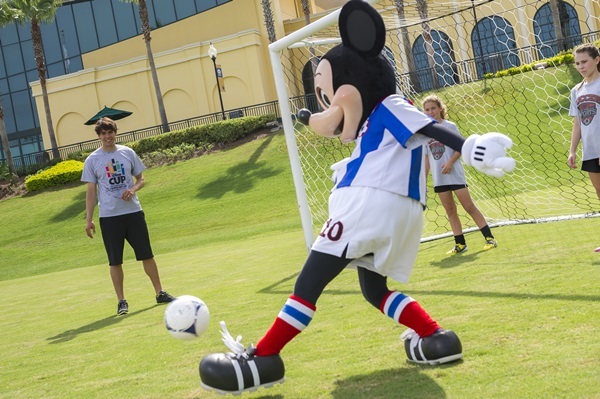 There are a number of ways to compete at the ESPN Wide World of Sports. There are the elite tournaments, spring training programs, and showcases mentioned above as well as open registration tournaments. There are also training camps that take place during major school holidays & summer vacation. 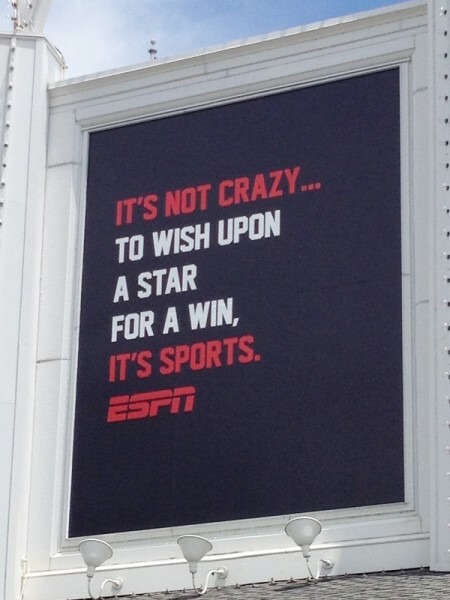 How Is Disney Magic Infused Into The ESPN Wide World of Sports? Throughout this tour it was mentioned over and over again that the mission of the ESPN Wide World of Sports is to make every athlete feel like they have made it to the big time. Whether it’s the Super Bowl, the World Series, or anything in between, the goal is to help these youth athletes get one step closer to their dream and remind them it’s about play both on the field and off. 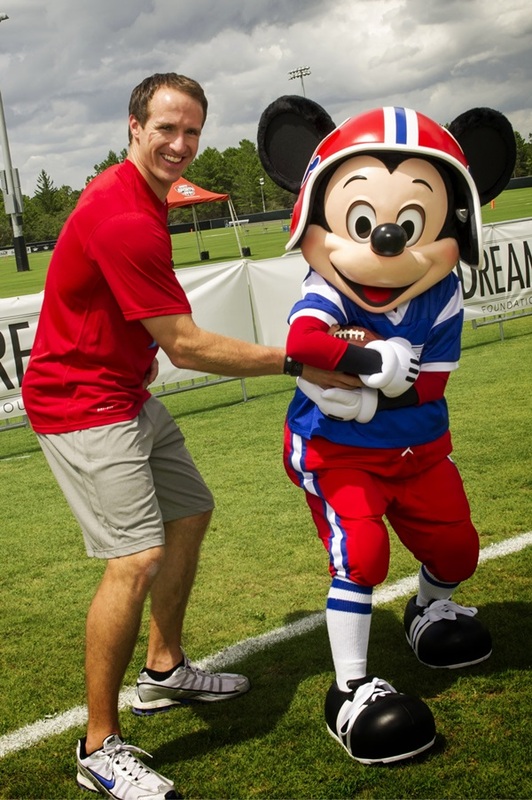 They get the chance to experience the magic of Disney through their love of sports. 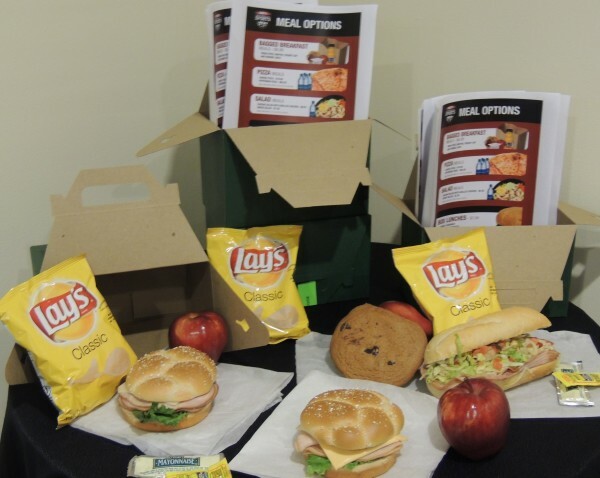 Playing in an all day tournament and don’t want to send the team parent out for fast food? 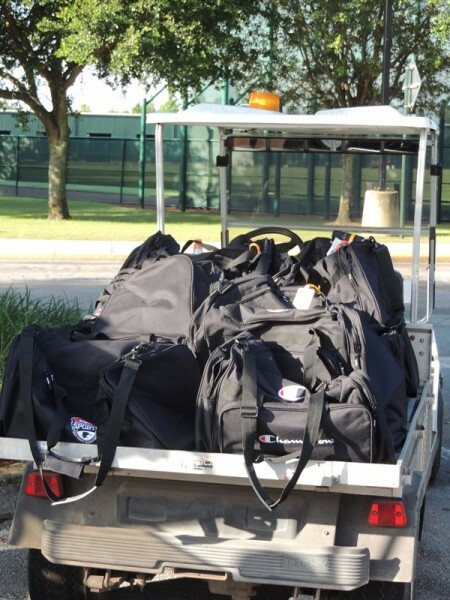 No problem the ESPN Wide World of Sports offers boxed lunches, bulk pizza orders, snacks, and even stocked coolers delivered right to your sporting venue. Leave your camera at home and let a personal photographer snap from 35 – 300 photos of your child in action. There are also team photo options as well as fun and memorable green screen packages available too. We had a chance to pose in front of a green screen, once with Goofy and once on our own. Then we were surprised with our after photos. 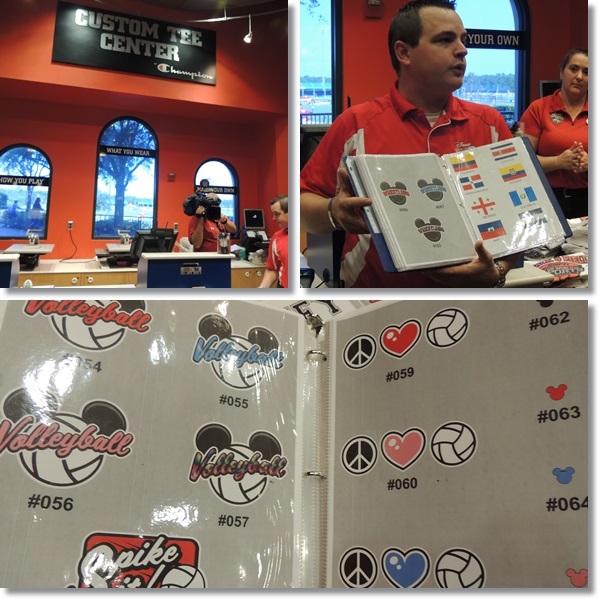 Here you can customize a cotton or performance based tee to commemorate your child’s time at the ESPN Wide World of Sports and have it ready the same day. The complex features 56 high-definition cameras that can capture your child in action and display live footage, highlights, and interviews on 40 high-definition video screens around the complex, on a dedicated channel in the Disney World Resort hotel room, or on the ESPN Wide World of Sports YouTube Channel. Some games are even broadcasted live on ESPN3, and highlights are sometimes shown on ESPN 2, ESPN.com, and SportsCenter. The Welcome Center can help you navigate both the complex and your Disney Parks vacation in many ways. 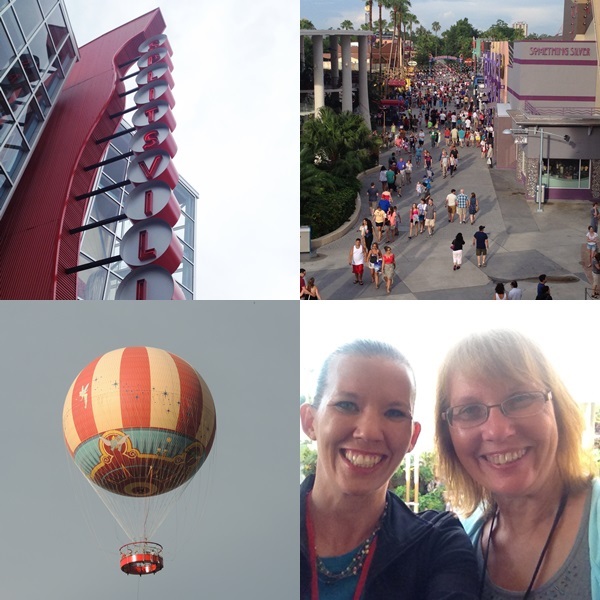 With maps available, concierge like services to help answer questions, order bagged lunches, make cheer cards, check the weather, find a restaurant that will accommodate the team, and even help plan a day at Disney with sample itineraries. 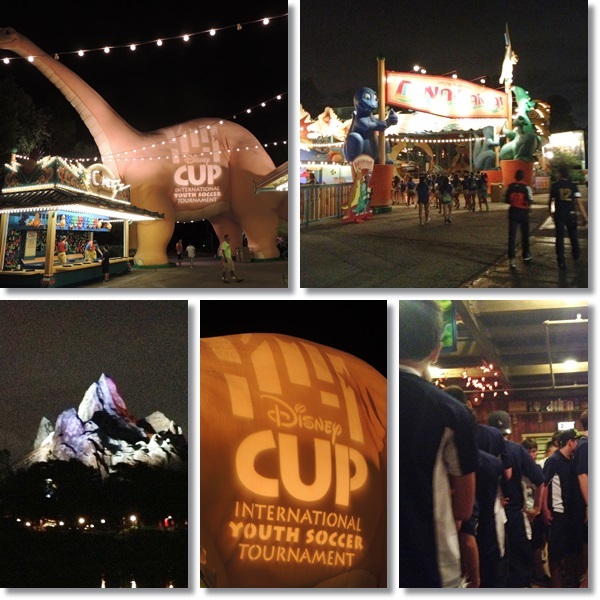 While on this tour we had the chance to attend the Disney Sports Festival International Youth Soccer Cup Opening Ceremonies which took place at Animal Kingdom after closing hours. That’s right. Our group, along with thousands of youth athletes and their families, had the chance to roam around Animal Kingdom after it was closed to the general public. We had a buffet dinner at Restaurantosaurus, played games in DinoLand, and got to ride Primeval Whirl, TriceraTop Spin, Dinosaur, and even Expedition Everest as many times as we wanted. Many of the kids and their families were from around the world and it was their first time visiting Disney. It was incredible seeing their never-ending smiles and the joy in their eyes as they got to experience an entire park to themselves and sing, dance, play, and ride the night away. What Other Fun Things Did You Do And What Else Did You Learn On The Tour? While on the tour I had the chance to check out the Disney Sports Festival Center Tent where athletes and their families could come to cool off in front of a number of fans and misters (it was 95 degrees when were were there!). At that time it also served as a place for Team Mom Check In where info was provided, questions were answered, and prizes were given away. 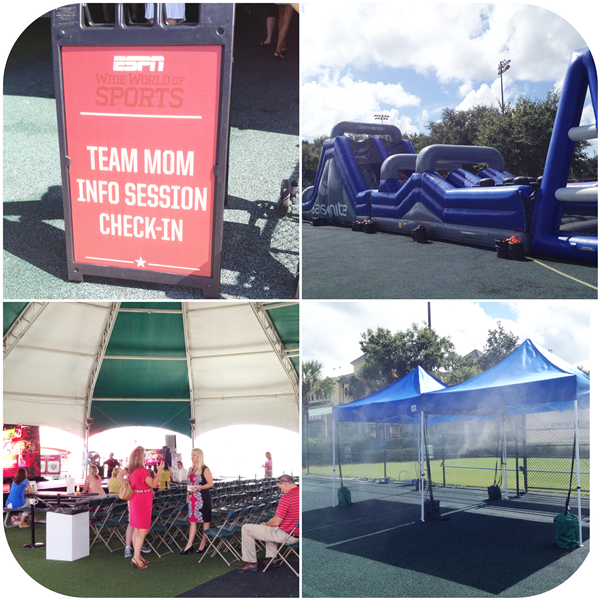 Athletes (and their parents if they were feeling young at heart) could charge through an inflatable obstacle course and play a number of tailgating type games. There is also a big screen tv where movies played in the afternoon. When we were there Star Wars was on the schedule. We also had the chance to be announced starting line up style as we walked into the ESPN Wide World of Sports Grill. It was fun, made us all smile, and is something I won’t soon forget. We had a fun evening at Splitsville in Downtown Disney as well. There was bowling, billiards, food, music, and lots of laugh, strikes, and smiles. 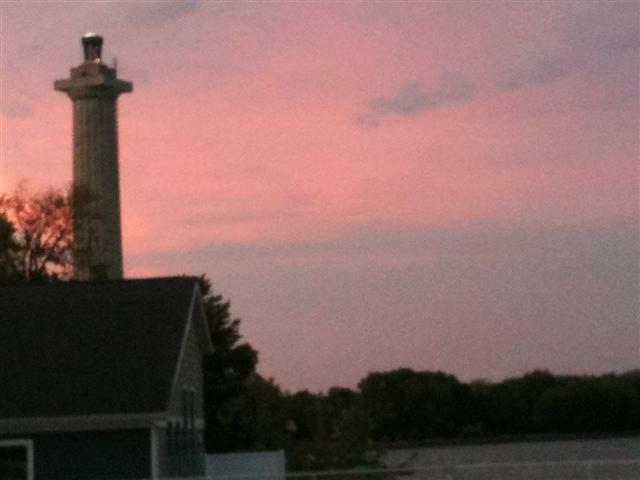 And the view from the upstairs balcony was amazing! One of the mornings we had the chance to participate in a runDisney Fun Run where we were able to run/jog/walk or push a stroller around Epcot World Showcase. 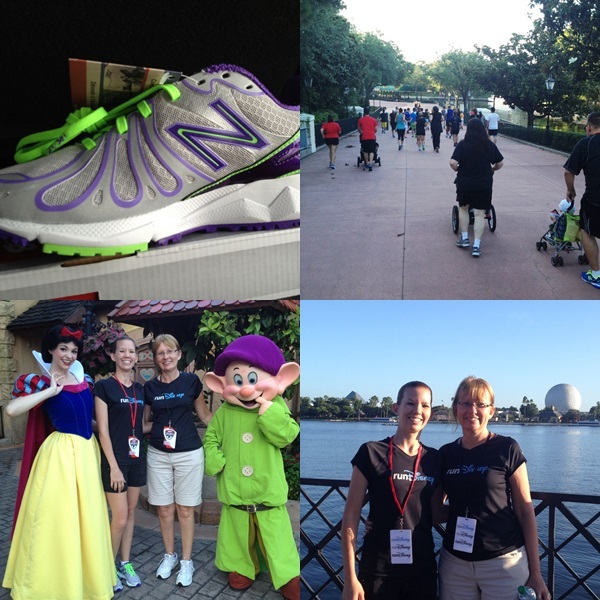 We were given runDisney apparel and New Balance shoes (that are the lightest shoes I’ve ever owned!) and we were off. I was thankful to be able to do this with my mom who had never participated in anything like this. It was a fantastic experience and now I see why so many people enjoy runDisney events, they truly are magical and memorable! We got to see the New Balance Track & Field Complex and hear from Ali and Andy about the partnership between New Balance and the ESPN Wide World of Sports. They also gave us a few hints about the upcoming New Balance runDisney shoes coming out soon and Andy talked the runDisney Expedition Everest Challenge – which he won! 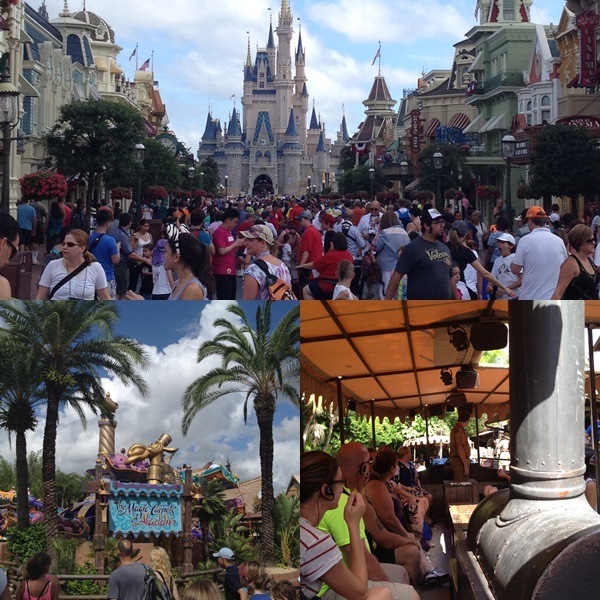 We also visited the Disney Parks of course! They are so close by that a visit was a must. As you can see by how busy Main Street in Magic Kingdom is many other people thought so too! 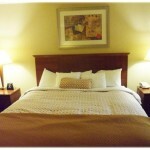 While on this trip we stayed at the Boardwalk Inn. 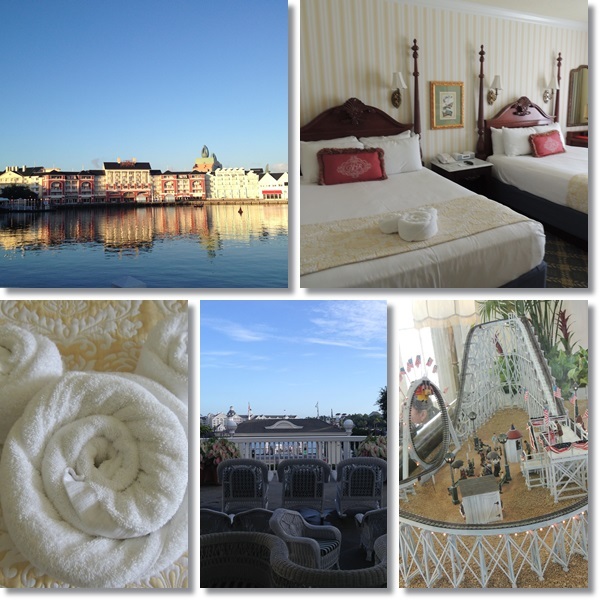 We loved the old time amusement park theming of the hotel as well as the many places to relax and take in the sites. I’ve heard the Boardwalk is lots of fun at night as well with a variety of performers. We didn’t get to see this because it rained every evening but the views in the morning made up for it. It’s a short walk to Epcot from the Boardwalk and our chartered bus ride only took about 15 minutes to reach the ESPN Wide World Of Sports. 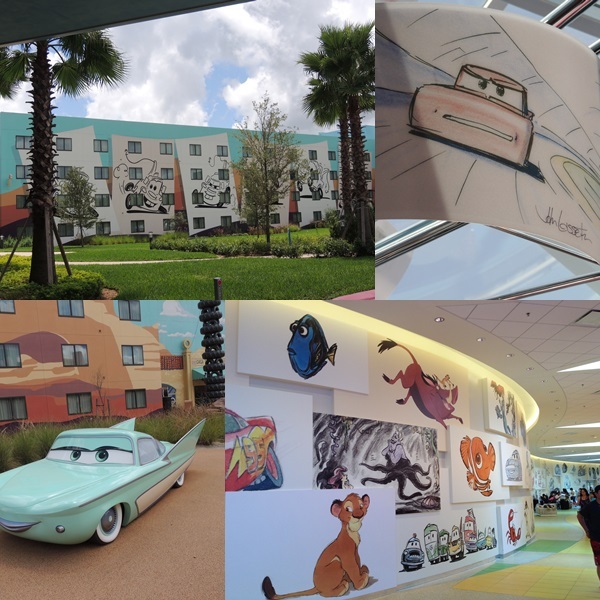 The Art of Animation Resort is also nearby and is always lots of fun with its larger than life Disney drawings, characters, and hotel wings. The lobby is one of my favorite places to visit. The pool is incredible complete with under water speakers. 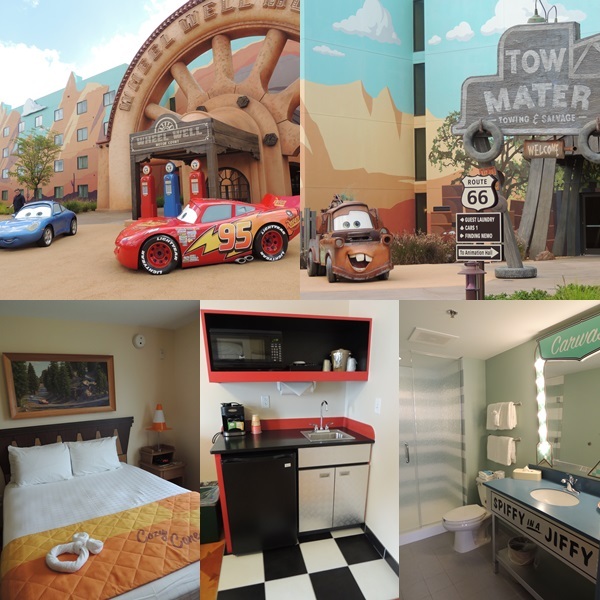 Each wing has its own theming and we had the chance to checkout the Cars wing and even took a look at one of the rooms. Wouldn’t it be amazing to stay here as a kid or for those young at heart? I had a fantastic time on this tour and would recommend a visit to anyone planning an upcoming Disney trip. There is so much to see and there are new events taking place every week. 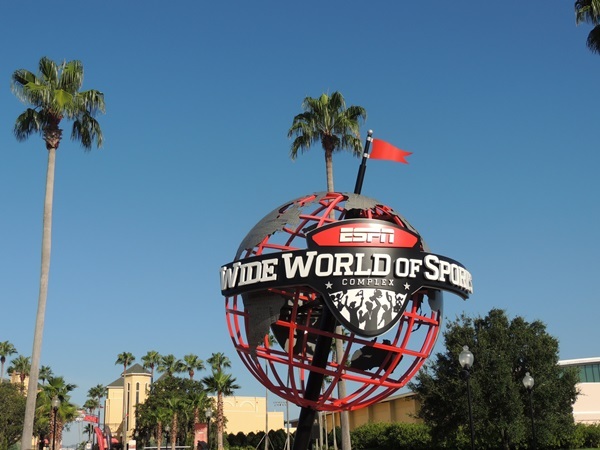 If you have a youth athlete take a moment to check out the ESPN Wide World of Sports site to see what it has to offer and how it can add a bit more Disney magic to your child’s athletic dreams. 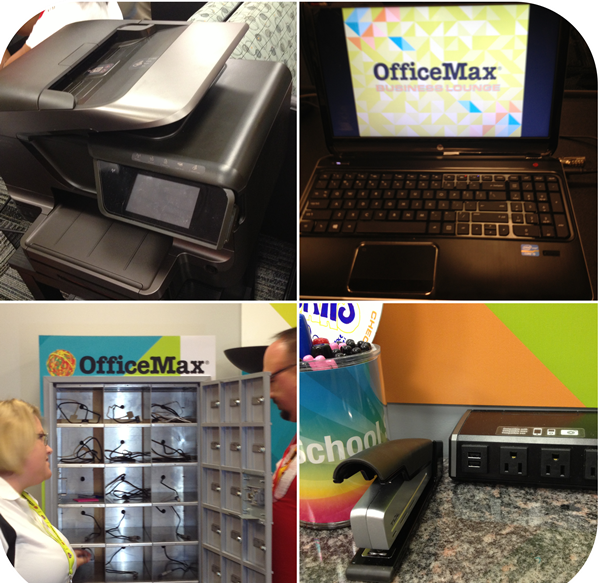 Airfare, accommodations, meals, park tickets, and other gift items were provided. The honest opinions are my own. I’ve seen it on tv and always wanted to go! Looks like a lot of fun! Looks and sounds like a lot of fun for the kids! Would love to go there someday! Huge sports fans in this house! Thanks for the post! I had no idea either until now! Although I am not really a sports fan I found this really interesting. I don’t know if I could have spent several days there, but I don’t know how you could have seen and done it all in less! Awesome! WOW! How exciting. 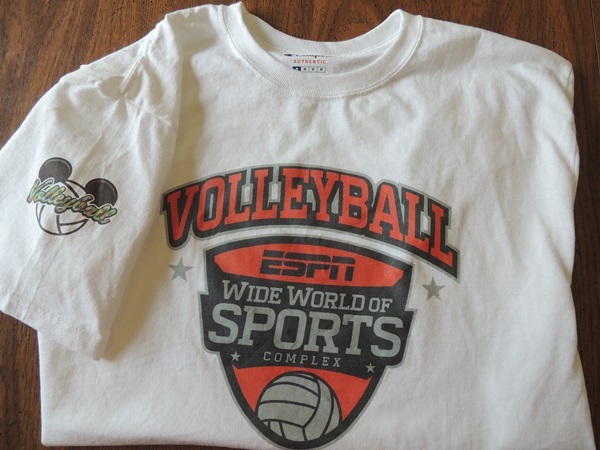 My kids would love to actually participate compete in the ESPN wide world of sports. I would love to see the Pop Warner Super Bowl. Lots to do here and see. Very cool! It looks like you had a ball here literally! I really like how detailed and all the pics. 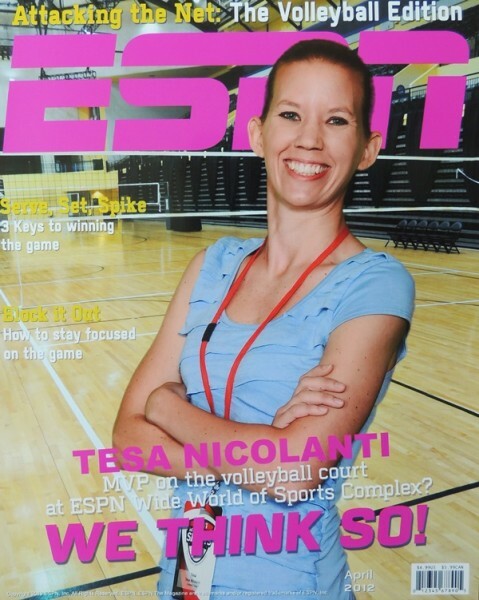 I also love the magazine cover with you on ESPN! We are sports nuts here too. Wow, this is an amazing place. I have never even heard of it. I think it’s so great that Disney supports physical fitness and provides just about all the fanfare one could think of to make it enjoyable. I love this post it was informative and you have so many great wonderful pics. Well thought out. Wow, this place is incredible! This is definitely some place that every sports player/enthusiast should visit. Wow this sounded and looked like a lot of fun. They are very organized to have so many things going on. I am impressed with your volleyball!! I was into softball and coached little kids for a while. I played too. Thanks for sharing your fun!! This is Amazing! I can’t believe how they have absolutely everything you could want at a sports facility. Great pictures showing off all they have. 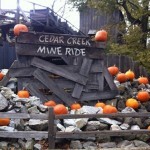 My husband would love to visit here. 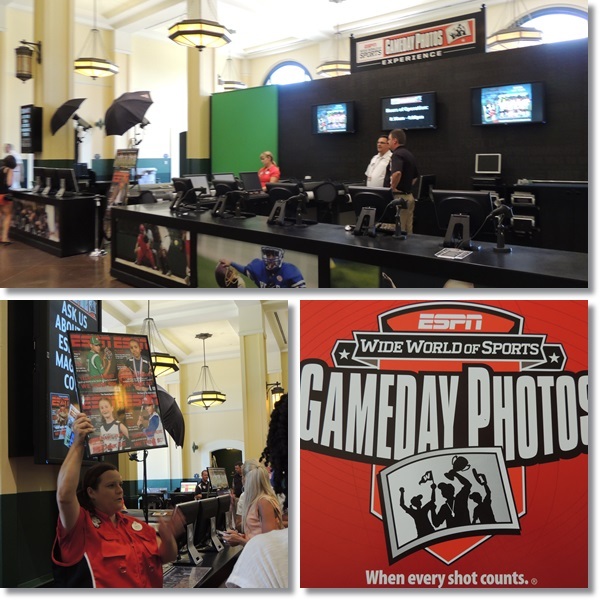 Those are some great photo’s and a great discussion with the ESPN Sports Center. WOW! You sure did a great job in discussing the ESPN Sports center and all that it has to offer. I did not even know this place existed. What a great place to practice sports and they even get your food to you. I like the pictures and find this place exciting! Love The Magazine Cover! So Much Fun, What A Great Sports Complex! What a fun place! 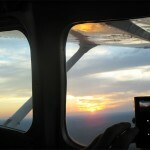 You captured some really great photos! Love you on the cover of the volleyball mag. Very fun trip you got to take. this is a great place for me. i am a huge sports fan and would love to go here sometime soon. wow what a great pictures.This would be perfect vacation for us.Great times for u!